An edited version of the interview appears below. Knowledge@Wharton : Can you give us a brief overview of your research? Raghuram Iyengar : Sure. This research was a field experiment that we conducted in collaboration with an international beauty company that, like many other companies, was taking inspiration from a lot of interesting things that are going on in the couponing world. If you look at what’s really hot these days, it’s about referrals. Many companies are doing it, especially tech companies. Airbnb does it, Uber does it, Dropbox was doing it, PayPal was doing it. Iyengar : The big takeaway for us is that while referrals clearly are a practice which is very mainstream, one should take a little pause. It might not be the case that referrals are always good. One of my colleagues at Wharton, Christophe Van den Bulte, has found that customers who are coming from referrals are better than other customers. But what about the senders who have to make those referrals? They are not that easy to do. You have to think about who’s going to be better off from getting this referral. So a big takeaway was, don’t ask for referrals from all of your customers. What we found was, customers who are high-loyalty customers, these are people who are committed to the brand. These are people who’ve bought from you quite a lot. These people turn into brand ambassadors. They not only redeem a lot, on their own, they share the coupons with a lot of people. But what happens for the low-loyalty customers — these are customers who occasionally buy from you; they’re not frequent purchasers — they are not very happy getting that coupon. Why? Because in some sense, you’re asking them to do the job for you. They might be skeptical as to why this firm is appointing us to do the job for them? Why do they want my network? So what do we find? These low-loyalty customers redeem a lot less when they’re given a referral coupon as opposed to a standard coupon. Knowledge@Wharton : Did any of these findings surprise you? Iyengar : When you think about referrals, it’s a big practice. The typical notion is that referrals work. What we found was, they don’t work for everyone. Even a practice like sending out referral coupons should be customized. That was a bit surprising to us. Because on the surface, it looks like something that shouldn’t change people’s behavior, whether they get a referral coupon or a regular coupon. But what we found time and again — and we did a bunch of field experiments in this paper – is that it’s a very robust finding. In fact, exposing people to referral coupons, even if they don’t share them themselves, actually changes their own behavior. Knowledge@Wharton : You mentioned customization. What are the key practical implications for marketers? Just the very fact that the company is being transparent, that they’re being upfront about how important you are, actually changes people to become even better brand ambassadors. They redeemed the coupon a lot more, they shared it with their friends a lot more. They shared it with friends who bought a lot more products from the company. Knowledge@Wharton : What sets your research apart from other research in this area? Iyengar : Much of the work in referrals is quite limited. And for what is present, there is typically no secondary data — data based on historical purchases. What we wanted to do was to work closely with a company with a forward-looking approach. 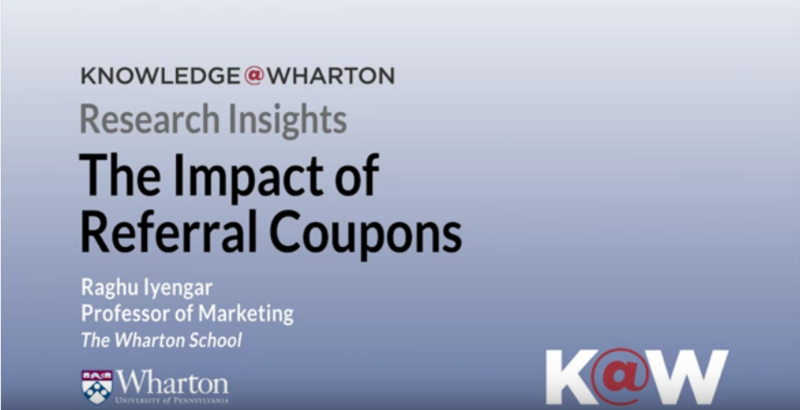 In a sense, why don’t we do a field experiment that can help us causally look at the impact of referral coupons on future behavior? So if the most important part of the research is looking at causal impact, doing the field experiment is the gold standard. I think what sets this research apart is the ability to collaborate closely with the company, and doing a field experiment. Knowledge@Wharton : What do you think you’re going to look at next? Iyengar : I really enjoy the idea of doing field experiments together with big data. To me, that alliance, that nexus, is going to be very fruitful later on. One of the things that I’m very interested in is this idea of the Internet of Things. Of course, there are many companies out there that are coming up with different products. For example, home automation products, home monitoring products. Do these really help? How much do they help? What do consumers learn from these products? We are working very closely with a company in Austin that is doing a lot with the Internet of Things in terms of electricity savings. They are actually doing a lot of experiments informing people how much electricity they are using, sending out text messages, using smart thermostats to see whether they are able to regulate their usage. That’s the next thing.